I saw these shoes in the latest James Bond movie, Casino Royale. 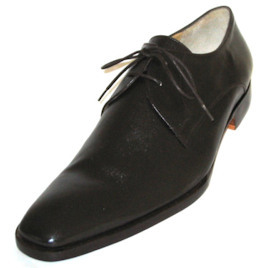 After a little bit of internet searching, I discovered that the maker of these shoes were an English shoe company called John Lobb. As one would expect, this shoe model, the \"Luffield\", was very expensive (around $1,440). I had heard about Magnoli Clothiers from web clothes fora like Styleforum and The Fedora Lounge. After a quick email and quick replies, I decided to see if I could get a reasonable copy of those shoes. The pictures do not do the final product justice! The fit of the shoes are absolutely perfect; the measurement instructions were spot on. The construction is by no means cheap and looks very expensive. In comparisons to existing pictures of the Luffield model, they are almost indistinguishable except for a few small details that only the truly trained eye would notice. I would highly recommend Magnoli\'s custom footwear service!